OPEC has decided not to cut oil production and prices are plunging as a result, but the oil cartel may be taking short-term pain for long-term gain in the oil market. From an economics perspective, the discussions taking place around OPEC today are fascinating. The oil cartel is trying not to lose control of the oil market to countries like the U.S. and Russia, while still maximizing its own revenues. In many ways, these two forces are diametrically opposed, leading to some very difficult decisions. The core problem is that oil is no longer the one-stop-shop it was two decades ago when OPEC supplied half of the world's oil. Today, U.S. shale producers, Brazil, Russia, and others are big players in the market, all having a vested interest in increasing production if the price is right. Let me walk through why that puts OPEC in a tough spot. As oil prices fall the price of gasoline has dipped below $2 per gallon in parts of the country. Image owned by The Motley Fool. Assuming increasing production is off the table, OPEC has three choices in deciding how much oil it supplies to the world. It can keep oil production where it's at today at 30 million barrels per day, or MMb/d, which has resulted in about 2 MMb/d excess supply, it can lower production to meet demand, or it can lower production to undersupply the market and send oil prices higher. In the sensitivity analysis below I've shown this scenario assuming flat oil production from the rest of the world and flat demand. The price per barrel at the bottom is assuming that today's price is the oversupplied price, around $100 per barrel -- as we've seen the last few years -- is equilibrium, and $140 per barrel is a peak, which we saw briefly in 2008. The proceeds to OPEC under each scenario are in the last row. For illustrative purposes. Author's own figures based on EIA data. You can see that on the surface it looks like OPEC should reduce production, push prices higher, and take home more money. But if you take a long-term view of the oil market you may see things differently. For example, if OPEC lowered supply to 26 MMb/d and the price of oil shot to $140 per barrel, someone would soon fill that gap, causing the price of oil to fall. Suddenly, OPEC would have a smaller market share and all it would get in return is a short-term revenue bump. A smaller market share may be the right path if it leads to higher prices and the market is growing. But what if OPEC had a smaller market share and the market for oil were shrinking? Shockingly, that's exactly what's happening in the developed world. Over the past decade, the U.S. and Europe have both been using less oil as energy efficiency improves, population density increases, and alternatives to oil pop up. 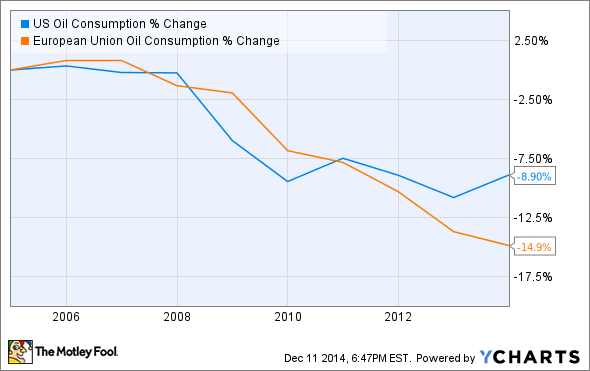 What's kept oil consumption growing, albeit very slowly, is growth in China. But there's a lot of worry that the Chinese economy may slow in the next five years, particularly after the government recently put in restrictions to curb lending that has fueled growth. The worst-case scenario is that China goes into a recession and then demand for oil could fall by 1 million barrels or more per day very quickly. Long-term, demand could fall further if the current trends continue. Let's complete that thought experiment and assume that global oil consumption actually falls in the next 5 years-10 years. If OPEC simply acquiesced to the market and reduced production to keep oil supply and demand in balance it could lose significant market share today and over time. If OPEC gave in and reduced supply by 2 MMb/d today to match global demand it would push oil prices up quickly. But if demand then dropped and the rest of the world didn't reduce supply OPEC may have to reduce supply again, further cutting market share. I've given two examples below, and you can see that if demand fell to 85 MMb/d and OPEC took the brunt of those cuts, it could potentially have to cut production by 30%. OPEC, and Saudi Arabia in particular, doesn't want to be in a position where it has to take the brunt of the world's oversupply of oil. So, its not giving in today, not because it's the right thing to do economically this year, but because it's looking at its market share over the next 10 years-20 years. OPEC wants to be able to capture higher oil prices in the future and have a larger market share, rather than own a smaller and smaller portion of a shrinking market. It's pain now for gain later. In reality, there may be no good strategy for OPEC if and when oil consumption begins to decline in a meaningful way worldwide. But while demand is steady, OPEC wants to maintain market share and squeeze out marginal players who can't produce oil at $60 per barrel, or less. The way I see it, OPEC can lose profits now for more market share and profit later, or lose market share now for less profit and diminished market share later. That's an area between a rock and a hard place, but it's reality in today's oil market, and OPEC has an unenviable decision to make in setting its own production levels.